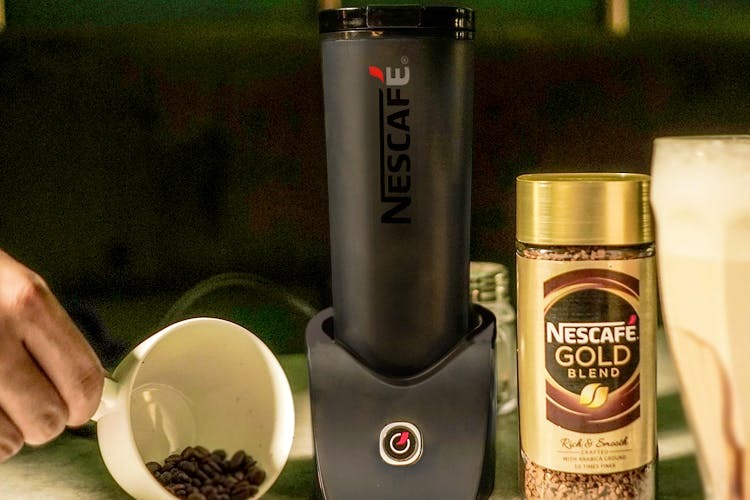 Shop É By NESCAFÉ At The Summer Mode For INR 6,000 ONLY! Coffee Lovers, ahoy! We’ve found the perfect product for all your coffee needs, especially for everyone who has no time to spare and always on the go. Imagine the feeling before 11am when you can get a café-like frothy cappuccino or chocolaty Iced Mocha Latte under a minute, right at home! Introducing the smarter way to your cup of sunshine - É By NESCAFÉ. Best part? You can make your coffee using bluetooth (you read that right!). Here’s everything you need to know that’ll make you rush to The Summer Mode to get your hands on É By NESCAFÉ at a discounted price. Instant coffee just became smarter and it’s time we keep up. If you’re anything like us, you’re probably always in a rush to go everywhere. Don’t fret, this smart coffee maker is our daily saviour! You can simply connect the machine to your bluetooth and tell the app to do the work for you! Select all your coffee preferences and ask É to start brewing while you can keep doing your chores/work. How cool is that?! The iconic mug shaped É by NESCAFÉ is a pioneering smartphone connected coffee-maker, all-in-one, created to re-invent the coffee preparation ritual to revolutionize your daily coffee experience! AND your app will notify you as soon as the coffee is done so you can just pull the mug out and take it with you wherever you go. Not just that, you can connect the app to your Facebook or Google accounts, connect with your friends, invent your own recipes and follow others’ recipes too! Gather ye’ coffee buds while ye’ may and join us at The Summer Mode, on March 23, from 11am to 8pm at Qla, Mehrauli! Head over to the É by NESCAFÉ zone to shop this smart coffee maker at a discounted price of INR 6,000! There will also be fun trivia challenges where you can win exciting merchandise and the #BrewYourStyle challenge for a chance to win the coffee maker itself! Download the NESCAFÉ É Connected Mug App here.